This 1-light semi-flush mount fixture features an oil rubbed bronze finish that will complement many urban, loft, industrial and transitional decors. 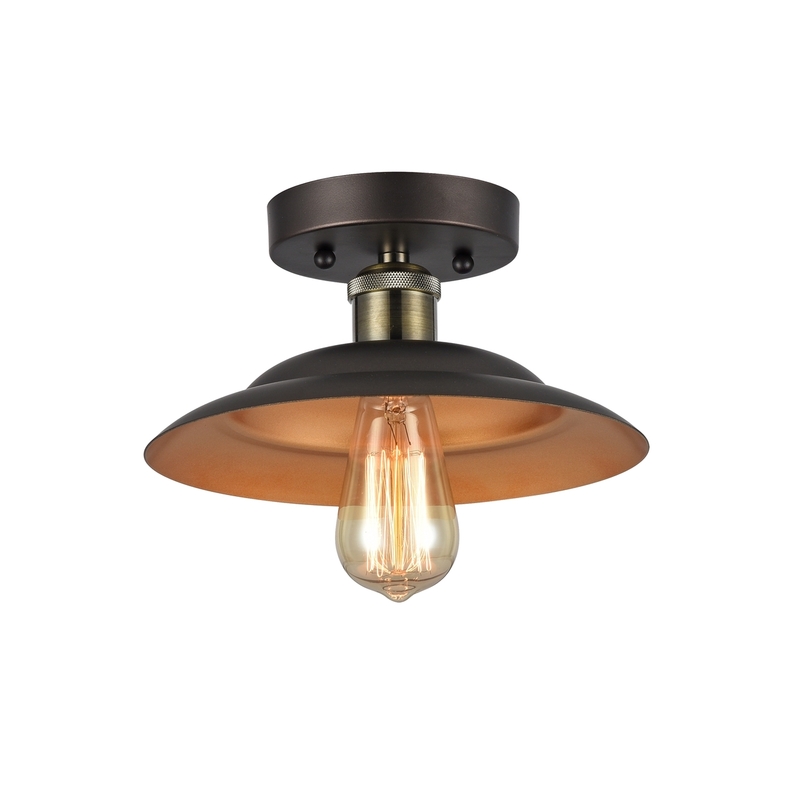 The matching metal shade has a contrasting gold inside that will create a warm glow to any space. One (1) 60 watt vintage Edison bulb included. Here is the packing information for the product. Since these are handcrafted products, the exact color of glass pieces may vary. Colors of the glass will appear darker and less vibrant when not illuminated. Handmade glass will vary from one piece to the other; glass made at different times will also vary. Light bulbs used in lamps or ambient lighting may affect the appearance of the products. Use the size under product specifications to determine the product size. Again, since these are handcrafted products, dimensions for all glass window panels and fireplace screens may vary from 1/4 to 1/2 inch. Fireplace screens are for decorative use only. For safety purpose, factory suggests the screen should be at least six inches away from the fireplace when on. Stained glass product has been protected with mineral oil as part of the finishing process. Please use a soft dry cloth to remove any excess oil. 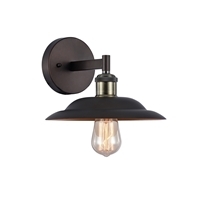 If you a reseller of CHLOE Lighting, you may use any images, pictures or text from chloelighting.com as part of your marketing of CHLOE Lighting products. Image and picture resizing is allowed only if the proportion is maintained. 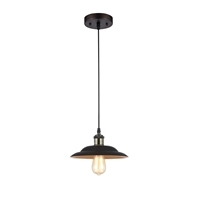 All images, pictures, and text remain the exclusive property of CHLOE Lighting. ANY RETURN MUST BE APPROVED AND HAVE AN RA NUMBER ON THE PACKAGE OR THE RETURN WILL BE REFUSED. (RETURNS NOTE, WE PROVIDE A SERVICE SO OUR CUSTOMERS, YOU, SO YOU DO NOT HAVE TO STOCK ITEMS WHEN WE DROPSHIP TO YOUR CUSTOMER. WE ALWAYS WORK HARD TO KEEP YOUR CUSTOMER HAPPY. WE ARE NOT THE RESELLER OR RETAILER, YOU ARE. SO WHEN IT COMES TO YOUR CUSTOMER NOT LIKING COLORS OR MATERIALS, CHANGING THEIR MIND OR SUCH, IT IS YOUR POSITION TO TAKE BACK PRODUCTS IF YOU WISH. IT IS JUST LIKE THE WHOLESALER THAT SELLS TO A MAJOR RETAILER i.e WALMART, SEARS, AND SUCH, WHEN A CUSTOMER RETURNS AN ITEM, THEY RETURN TO THE RETAILER THAT THEY BOUGHT IT FROM NOT THE WHOLESALER. THIS IS WHY WE, AND MOST WHOLESALE COMPANIES AS WELL AS MAJOR RETAILERS IN MOST CASES HAVE A RESTOCK FEE. YOU SHOULD CONSIDER HAVING A RESTOCK IN WHATEVER TYPE SALES YOU PROVIDE. AND, AS PER PAYPAL TERMS HAVE THE END CUSTOMER PAY FOR ALL RETURN SHIPPING). Returns: Can they be returned? The protocol for returns MUST BE FOLLOWED. A picture of the damage has to be taken by you or your customer, then, that picture is emailed to us, then we will send a pick-up and EITHER send a NEW item, OR refund, OUR CHOICE. This is VERY important. If a lamp or stained glass panel is returned for any other reason (did not like the color, did not like the size etc) then there is a 15% restock fee. Because in most cases when the item is returned, we have to supply NEW PACKING AND NEW BOXES to resell. And, the more these items are in transit, the more opportunity for damage. So INSURE ANY RETURN,, because we will NOT refund a damaged returns unless we have received pictures prior to the return & you have approval to return the item/items. And the damage must be the same as we send these lamps for repairs in some cases. If a lamp show damaged to be determined that it was caused by the customer, it will NOT be covered unless additional insurance was purchased. We cover 99.999% of all claims for the USA. Customer in SOME cases must pay return shipping, as per claims. Return Items: Should you wish to return an item to our inventory, there will be a 15% restocking fee and shipping & handling will not be refunded. If the item is defective outside the normal product quality then we will gladly replace or refund the item at OUR Claims departments decision. All damaged goods, and defects are to be reported to us within fourteen (14) business days after your shipment was received. Replacements or refunds are the sole decision of our claims department. If an item is returned because the customer does not "like" it, then the return policy and fees apply. This is in all cases and return shipping is NEVER paid by our company. We do NOT insure international lamps orders Adigital photo must be emailed of ANY DAMAGE If the item is defective outside the normal product quality then we will gladly replace or refund the item. All damaged goods, and defects are to be reported to us within fourteen (14) business days after your shipment was received. We do NOT pay return shipping on ANY item at ANY time. A return credit for product cost (less shipping) will be issued within 15 days of receipt in the Returns Center to the credit card. Account used for the original purchase even as PayPal return rules state, it is to the BUYER to pay for return shipping. Shipping fees are REMEMBER, WE ARE A WHOLESALER. SOME RETAILERS HAVE A RETURN POLICY WITH NO RESTOCK FEE, THEY CAN ABSORB THIS BECAUSE OF THEIR OTHER SALES AND MARKUP, WE CAN NOT. Lamps, lamp are handcrafted, colors may vary, lamp base colors and or shapes may vary. There are NO refunds for these reasons.THE MORE LAMPS ARE PACKED AND REPACKED, THE MORE CHANCE FOR DAMAGE, SHOULD THE LAMPS BE RETURNED, AND UPON RETURN HAVE DAMAGE, THERE WILL BE NO REFUND. These lamps and stained glass panels are 100% REAL glass, stained glass, swirl glass crackle glass and other great processes are use in these GLASS items. There is NO plastic in these items. These items have more opportunity once unpacked to be damaged, so, if the customer returns the lamp or panel and it comes back damage the customer must file a claim with the carrier they shipped it with. The 15 % restock fee is because we are a wholesale company and do NOT carry the mark-up to pay for return shipping and or repacking, once unpacked and returned MOST lamps and panels must be repacked and boxed from scratch. These items are sold for RESALE, if one is purchased for your own use and returned, the SAME policy applies. If a customer provides a claim of damage, and we issue a pickup and when the item is returned there is no damage, then it is the customer who pays return shipping, any pick up fees and the 15% restock fee.